You may have noticed from time to time an aroma emanating from your dog that makes you want to head to the kitchen for a salty snack. It’s not just your imagination when you think your dog’s paws smell like corn chips or popcorn. Yes, I’m talking about Frito Feet! If you’ve never noticed this before, go ahead and take a whiff of your pup’s paws and there’s a good chance you’ll see (and smell) what I’m talking about. Compared to all of the other possible smells that can come from a dog, this one is rather pleasant. Unfortunately, what creates the aroma is not so pleasant. It’s caused by bacteria or fungi that are thriving between your dog’s toes. Ok, you’re probably not quite as hungry for that snack now, right? A lot of factors can contribute to your pup having a case of Frito feet. 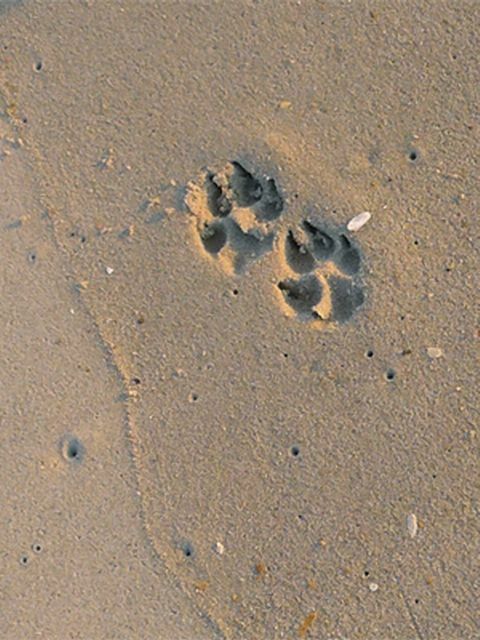 Dogs walk around on a lot of dirty surfaces. They also sweat through their paw pads and lick their paws which can introduce microbes between the paw pads. Combine these factors with lots of skin folds and excess fur that can limit air circulation and you have an ideal breeding ground for yeast and bacteria (like Proteus or Pseudomonas) which causes the strange corn chip aroma. Normally you don’t need to be alarmed about the smell, it’s completely natural for many dogs. I’ve noticed this issue many times with Haley and have been reassured by my vet that it was perfectly normally. Unless there’s a foul or constant overwhelming odor, there’s no reason to be concerned if your dog is not exhibiting any other symptoms of the feet such as an injury, sore, tumor, skin/pad changes, excessive licking of the paws or limping. If you’re bothered by the odor, you can give your dog regular paw baths using her regular shampoo and keep the fur between her toes trimmed short to help improve air circulation. An interesting video by Dr. Karen Becker addresses yeast infections or imbalances that could be related to this condition, especially if your dog also suffers from other ailments such as allergies, skin infections or recurring ear infections. If you’re concerned about any of these conditions, please talk to your vet to determine if treatment such as disinfectant baths or dietary changes may be necessary. 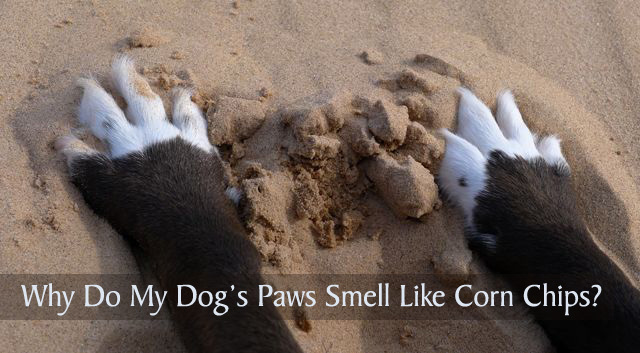 Have you ever noticed your dog’s paws smell like corn chips? Did you bathe your dog or treat the condition? I guess there are much worse smells in the world, so I’ll take it…but still, kinda gross when you think about the *why*. Sharing! I never really mind the smell very much, it’s kind of funny to me. They do get into everything with those paws. I hate to think about that part, haha! Thanks for stopping by Jim. I enjoyed checking out your gorgeous huskies and the Christmas puppy video. I love the smell of Frito feet (despite not caring for Fritos). In truth, I love all kinds of doggy smells (obviously, Honey is not flatulent or I might reconsider). But I’m becoming increasingly aware that I’ll be selling my house in a few months and that most other people aren’t as enchanted for dog smell as I am. I guess Honey will have to look forward to a few more baths as we get closer to putting the house on the market. I don’t mind the Frito feet smell either. I read that it’s a good idea to hide traces of owning a pet when showing your house, but that would be pretty hard to do, especially at our house where there’s always Haley hairs to be found somewhere. Interesting. I never noticed this. Of course I really don’t smell their paws. I usually notice the Frito smell when I’m on the floor petting Haley. Luckily, it’s not always there, just occasionally. I never noticed it before either, until I got Haley. I remember thinking it was so weird and wondering where the smell was coming from, haha! Ha, the look my dog gave me when I tried to smell on his paws.. like she’s mad, but hey..
Couldn’t find any yummy though. But my dog smells really good behind his ears. Oh my goodness! I came across this page while researching why the fur in my dogs paws is a red/brown colour. I always joked that his paws smelled like Doritos, and now I know why! Thank you, I’m calling the vet tomorrow! I’m glad you stopped by Vanessa! It sounds like your pup is licking his paws which is really common with allergies and other skin issues. Their saliva causes the staining of the fur. Haley’s allergy issues have increased over the last few months and we’ve had amazing results with Apoquel but there are a lot of self-help (or maybe I should say pup-help) things you can do at home if he’s having mild allergy issues. Good luck at the vet appointment! Cats have the same exact smell on their paw pads! We had many cats in our day in my family and later I got 2 dogs (Maltese) since my allergies are so bad with cats 🙁 . Both dogs have the corn chip smelling paws. My sister and myself called our cats (we had many) those “corny paws” and then I did a Google just now. We are not alone in our olfactory senses haha! great article and I shared to my siblings.